What an excellent question, Maria! You have obviously planned your puppy carefully, and thinking about that exciting first day you have reflected on the importance of getting it right. 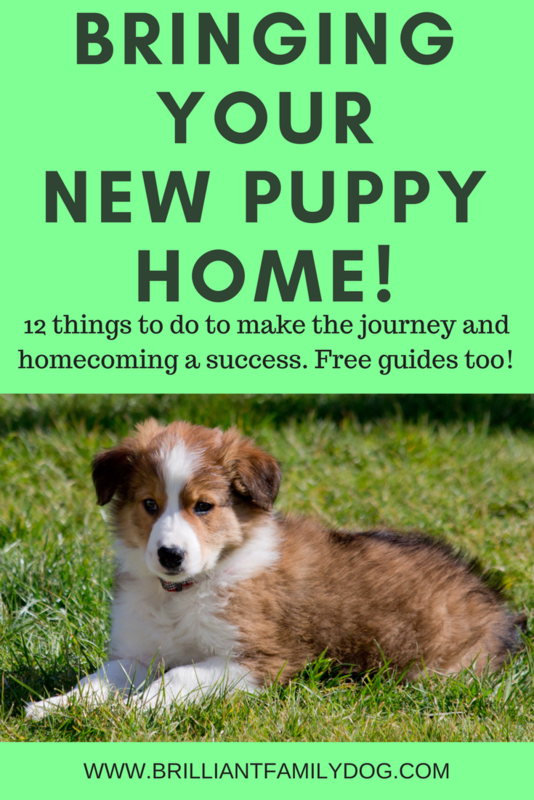 You’re setting the stage for your new puppy’s life. 1. The most important thing is to make a comfy den for your puppy. Somewhere he can feel at home, somewhere he is fed all his bowl-meals (you’ll be mainly feeding him by hand! ), somewhere he is safe and may not be pestered by children, visitors, or other household pets. He needs to be in a quiet place to be able to switch off and sleep properly. I favour a robust wire crate. It need only be big enough for the size your puppy will be as an adult - big enough for him to stand up, turn round and lie down again, as lying down is mostly what he’ll be doing in there. You can half cover it with a cloth or put it in a cupboard space under the kitchen worktop to make it cosy. And you can use either a custom divider or a big cardboard box to make the space just big enough for your puppy. All naps will be taken in this crate, and he can sleep in it at night, in your bedroom. Now you have somewhere where you know your pup is safe and can’t be chewing the telephone wire, peeing on the carpet, or demolishing your furniture. He may protest to start with, but as long as you know he has had his needs met, regard the crate as soundproof - both ways! He’ll quickly learn that being in the crate means rest and sleep. 2. For travel you’ll need either the same crate if it’s small enough to move easily, or a custom car crate. Again choose a wire crate - I don’t use a soft crate till I know the dog is content in a crate and won’t chew or attack it. I’m not convinced about the safety of car harnesses and always travel mine in well-built crates with escape hatches on the inside. For the journey home you may want to shroud the bottom half of the crate with plastic sheeting on the outside (that pup can't reach) so that any vomit stays inside! Or one of those airline crates that split in half would be excellent for this. 3. Take your puppy’s new collar and id tag with you and put it on him before you leave his old home. Better to be sure, in case of accident or drama on the journey home. And puppies are much wrigglier than you may remember - always slip a finger or thumb through his collar when you’re carrying him. 4. For the journey home, park your puppy in his secure crate with lots of washable bedding or screwed-up paper to make it cosy. Ignore wails and cries, throwing up and peeing in the crate. You need to focus on the road and not get anxious yourself. The journey cannot be avoided so get it over with fast! Gentle music on the radio may help, and covering the crate so he can’t see out of the vehicle will also probably help. Placing the crate in the body of the car, not the back end, will minimise swinging and lurching and maybe prevent carsickness. 5. If you have eager children at home waiting to greet the puppy, ensure they keep cool and don’t overwhelm this poor scrap. He’ll be exhausted after his journey, and is being constantly bombarded with strange sights and smells and people. 6. If he’s in a mess from the journey just wipe him over - don’t bathe him now. He needs to keep his own scent and a bath would be too stressful. 7. You can take him out on a lead to the garden to see if he needs to relieve himself. Don’t worry if he doesn’t. If he’s scared bring him right back in again. Get my Errorless Housetraining Cheatsheet and get it right from the start. 8. Introduce him to his new den, and put his mother’s blanket in there along with some chewables. Feed him a light meal in the crate, try the garden again, and have some gentle play with him before he crashes for the night. Puppies need an astonishing amount of sleep, and a young puppy should only be awake for an hour or so at a time. 9. Stick to the food he’s already on for a week or so, then start to change to a better food. You can research those in advance. Breeders often get free packs of food from canny manufacturers, so you’ll want to improve on that. Here’s a good site which gives you the lowdown on dog food ingredients. It’s geared for the UK market but is very educational and would be well worth a visit wherever you live. For a free no-obligation trial of some excellent home-cooked food (UK readers) go to www.butternutbox.com/brilliantfamilydog They provide instructions for how to change your puppy on to a new feed. 10. By all means have some visitors to admire your new puppy, but be sensible! Give him a day or two without visitors. Then ensure your puppy wants to go forward to greet them. If he hangs back or hides, on no account force people on to him. As you’ve planned so carefully in choosing your pup, he’s likely to have been well-socialised in the litter. You’ll probably be visiting the vet for a check-over and some jabs. Make this visit as gentle and calm as possible - don’t pass him round the waiting room of ooh-ing and aah-ing people! And while he can’t yet go out for “walks” you should certainly take him out and about with you on your errands. He gets used to travelling in the car on short journeys, and you get to carry him about to see new places, things, people, and dogs. He doesn’t need to meet the dogs yet, but he does need to see them. 11. Build a routine of naps, food, garden visits, play … and more naps. This routine doesn’t have to be timebound, but the order should become predictable. He’ll be on four meals a day to start with, and most of those will be handfed by you, or in a foodtoy - not just slapped in a bowl. 12. Lastly - and importantly! - learn how to teach your new dog. It’s important you find only a force-free trainer to work with, who will have small, calm, classes, and teach only through kindness and love. Stuck for a local class that fits this description? No worries! Check out this mini-course and enjoy training your puppy at home with me, with four specially-selected training videos. It’s much better value than a conventional local puppy class - you can take part for as long as you like! I hope that helps you with your planning, Maria - and I wish more people thought ahead as you have!